The Wilderness Systems Tarpon 120 is the most popular Tarpon ever. The Tarpon 120 is a versatile sit-on-top that offers stunning performance for surf play, ponds, lakes, and bays. The Phase 3 AirPro seating system adds comfort and easy adjustability. An exceptionally large rear bungee tankwell allows for storage of any gear needed for long hauls while the two hatches provide dry storage below the deck. For 2015, the footbraces have been upgraded to the Keepers XL system which offers a larger trigger and adds 5" of rail length. The Tarpon 120 kayak is known for offering excellent glide and maneuverability, and great versatility for its trim size. I love this kayak and it is perfect for a newbie to kayaking. Easy to maneuver and fish. Plenty of storage and ways to set it up to your needs. Great Coustomer service at Austin Kayak and help for the first time buyer. Could not be happier! Great kayak for me. I am 66 years old - 6'1 and 260lbs. Feels very stable and very easy to paddle. Very comfortable . Easy to get in and out of also. Would highly recommend .. I Love this Boat!. I've only had it 3 weeks but it's great. Sturdy, easily maneuverable, tracks great and stable. I've paddled 4 miles one day and wanted to do more. This is a great boat for a first kayak (like it was for me). I would recommend this boat for anyone! Started with the Tarpon 100 but missed the rudder when taking photos so I got the 120. Tracks better and rudder is great. All my fishing gear from the 100 works on the 120 so no changes were needed. Easy in and easy out when sitting on the kayak. Great job guys, thanks! This is the third tarpon 120 that I have purchased from ACK in the last 4 years. ACK prices and customer service are outstanding and everybody loves these kayaks! Seat comfort, gear storage, versatility and additional features are perfect, and the improved footpegs on the 2015 are a nice improvement. Knowledgeable and helpful staff have been great when questions arise and as I purchased additional items. 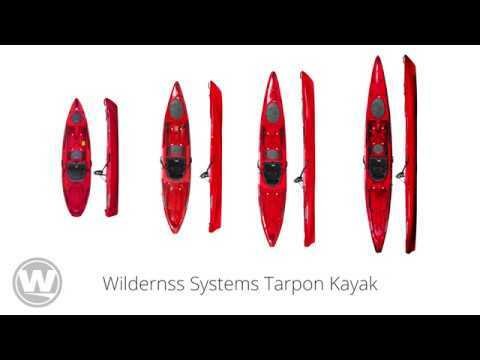 I have only used the 2015 Tarpon 120 for 3 or 4 outings so far, but it's a great yak. It has more speed and much better tracking than my old Tarpon 100. Compared to my fathers Ride 115 (also 2015), the Tarpon 120 still tracks considerably better and is slightly faster. The Tarpon 120 is stable enough to sit side saddle comfortably and with practice you can even stand up to look for structure under water that might hold bass. Fishing while standing is a different story though...The in hull storage seems more than sufficient and easy to use, but a 230 cm spare paddle (in halves) won't fit inside the bow hatch if you were wondering. My 230 cm paddle fits well in the tank well though. Overall this is a great yak of all trades. If you fish both rivers and lakes the Tarpon 120 is excellent. My first kayak and I love it! Lots of room in the rear tankwell for my dog and the maneuverability surprised me. This is my first Kayak. I love this tarpon 120. It is very stable. ACK has been very responsive. The kayak arrived as promised. It was well packaged. I caught my first fish yesterday. I have had this kayak for a couple months now and love it. I mostly fish inshore and some BTB and is handles very well. Its extremly stable and tracks very well. I never feel like im going to flip it even when sitting side saddle hanging of the side. Also, this boat is extremly fast. When im paddeling with others i often times have to stop and wait for the others to catch up. I ordered mine with the rudder option and after being caught in some pretty windy conditions and strong currents i couldnt imagine not having it. Haven't had any problems with water leaking through the hatches and ive had mutiple waves crash over the bow and flood the cotpit and the improvements to the hatches for the 2015 model work. You can stand in this model if the conditions allow. When im on the flats and back in tidal creeks you can paddle around just like your on a paddle board if you have good balance. If your double thinking this kayak just go ahead and get it and after the first time your on the water you will be glad you did. Q: what is the diameter of the scupper holes? A: The diameter tapers from 1" to 1 3/8". A: The tarpon 120 is a great fishing and touring kayak, it has great stability and lots of room to add accessories. Q: looking to by tarpon 120. I am 6f tall, my wife is 5'5, my kids are 4-5'. What paddle lengths are needed. Thanks. A: The kids would want a 230cm paddle, the wife might want a 240cm. You could also use the 240cm but you might be more comfortable with 250cm. It depends on if you are more of a vertical or horizontal paddler. Q: Can the Tarpon 120 be fitted with the AirPro Max or similar seat? A: Yes, a shorter rail can be installed without impacting the warranty. Q: Are there any changes in the seating area of the boat..for example: Is the seating area slightly more reclined than in 2014? Thanks! A: The seating area is the same mold on the Tarpon series for 2014 and 2015.